The past four days I have been attending Gen Con, the largest gaming convention in the United States and probably among the largest such events of the year. I am still planning on the second part of post on the Kuldotha Hawk Deck Flashback, but that will have to wait until Tuesday. Today I want to briefly talk about my own experience at the conference and share a photo gallery that captures much of the spirit of the event. As my regular readers might be aware, my wife and I are both aspiring fantasy authors, so we spent much of the conference attending the Writers Symposium, which is a series of panels and presentations by various successful authors in the speculative fiction market. I also took an entire day to play in a couple different Pathfinder modules through the Pathfinder Society. The rest of my time was spent crawling about the Exhibit Hall, playtesting games, gawking at all the 'geek-tastic' merchandise, and nearly being trampled by the sheer press of numbers that engulfed the hall. My wife and I purchased a couple new games which I will be reviewing in future posts. I did browse through some of the Magic the Gathering booths and tables, but since I have no experience playing in any sanctioned events in person, I never actually picked up a single Magic card the whole weekend. Overall it was a lot of fun. 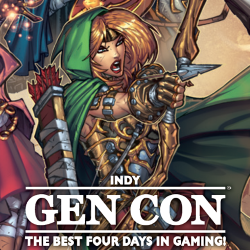 Gen Con is an event like none other, and the sheer volume of games and resources at your fingertips is mind-boggling. Equally inspiring was sitting among at least several hundred roleplayers all playing the same game (although different modules) at the same time. And, of course, the sheer volume of cosplayers was staggering, ranging from the excellent to the funny to the vulgar. If you enjoy that sort of thing, our local newspaper already posted a fantastic photo gallery that I recommend you check out. I am also exhausted, feeling under-the-weather, and behind on several projects, having gotten up for the last three mornings well before sunrise and going to bed way past my normal time. My kids haven't seen their parents except for brief snatches over that same span of time. Which means I need to finish off this post and get back to the tatters of the life I have been neglecting for Gen Con. It was a ton of fun, and I'm already looking forward to next year.